Purchase a Vigo faucet that is sure to accentuate your kitchen design for years to come. Stainless steel finish with matching deck plates all solid brass construction which ensures durability and longer life. Faucet features a dual pull-out spray head for aerated flow or powerful spray. Includes a spray face that resists mineral buildup and is easy-to-clean. Stainless Steel Pull-Out Spray Kitchen Faucet with Deck Plate Purchase a Vigo faucet that is sure to accentuate your kitchen design for years to come. Stainless steel finish with matching deck plates all solid brass construction which ensures durability and longer life. 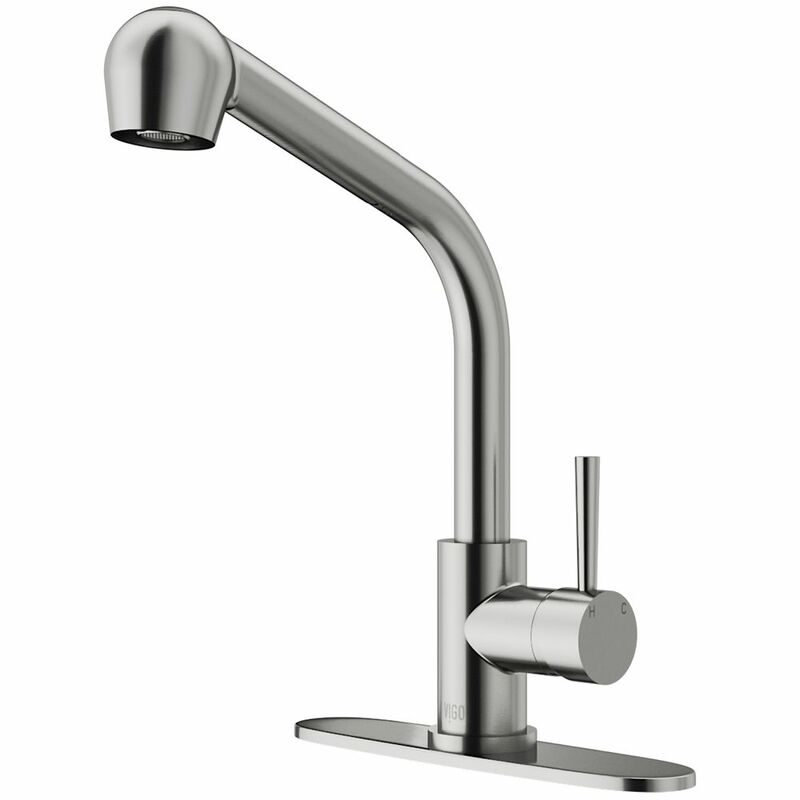 Faucet features a dual pull-out spray head for aerated flow or powerful spray. Includes a spray face that resists mineral buildup and is easy-to-clean. Stainless Steel Pull-Out Spray Kitchen Faucet with Deck Plate is rated 4.5 out of 5 by 47. Rated 5 out of 5 by Ted from As advertised. Like the look. As advertised. Like the look. Rated 5 out of 5 by Billy Bob P from Sleek design and easy to use... I recently had this faucet installed. Brush stainless steel, with a plate. It sits high and it's very easy to use. Rated 4 out of 5 by Betty48 from Great customer service department This was the second time we needed to replace the cartridge. We received the part at no charge! This time we wanted to replace the cartridge without the expensive help of a plumber. With the help of the people at the service department we were able to replace the part. Thank you again! Rated 4 out of 5 by bobbyc176 from Looks Great - Works Great - Hose wearing out Installation was pretty quick and easy. The hose is fraying though. Hopefully a replacement hose is available. Rated 4 out of 5 by Only1Way2bCool from Performs and looks good! After removing the flow restrictor, we have excellent pressure. Simple installation - only wish a tool was included to large nut, something beyong my ability to finger tighten. The finish is an exact match to our kitchen appliances. So far we are very pleased. Rated 3 out of 5 by oniongas1 from Great faucet but... The faucet and it's features are nice. The restrictor in the supply line was defective and would not allow any water to pass in to the faucet. The plumber was not too happy.